The next recipe I made for the Modern Baker Challenge combined something I love (pine nuts) with something I’m not so crazy about (macaroons). In my book, macaroons rank right up there with meringues. They have the same lighter-than-air quality that makes me wonder why I bother with them. And like meringues, they don’t keep well, so you have to plan on eating them the day you make them. Given my lack of enthusiasm and the must-eat nature of these cookies, I decided to make a half batch. 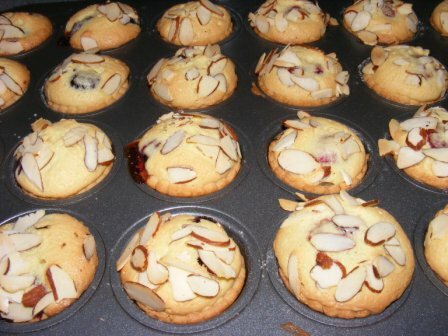 I didn’t have any almond paste, so the first order of business was to mix up a batch of homemade almond paste. I measured out 4 ounces of the almond paste, mixed it with granulated and confectioner’s sugars, and beat them together in the stand mixer while I gathered the rest of my ingredients. 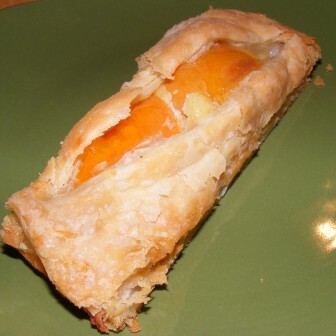 I added vanilla and an egg white to the dough and stirred it just until everything was mixed together. 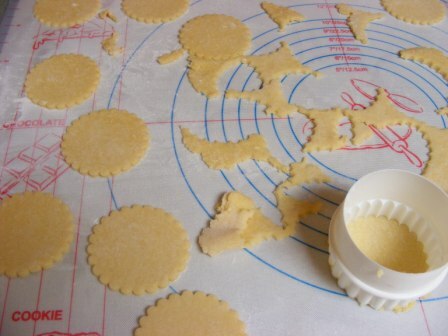 I spooned the dough into a pastry bag and began piping the cookies onto the baking sheet. I could tell right away that the dough (which was more like a batter) was too loose, probably due to the egg white. I buy my eggs from a local farm, and they aren’t sized or graded. The recipe calls for large eggs, but mine were probably closer to jumbo. The dough/batter started to spread on the cookie sheet, so I piped the macaroons as far apart as I could. The final step before baking is to flatten and moisten the cookies (unnecessary in my case), then to sprinkle them with pine nuts. I pressed the pine nuts into the dough a bit, then baked the cookies in a 375°F oven. The recipe said to bake them for about 20 minutes, but mine were starting to smell quite done by 15 minutes, so I took them out. They weren’t pretty (hence the reason I didn’t take any pictures). They baked together into one big, flat, brittle-like mass. But they smelled good; and they had that macaroon shine to them. I let them cool on a rack, then broke off and sampled a piece. And another. And another. Then the girls appeared and started breaking off pieces, too. And before long most of the pan was gone. 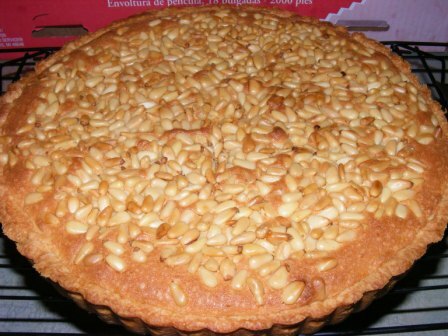 They had a great nutty flavor from both the almond paste and pine nuts. 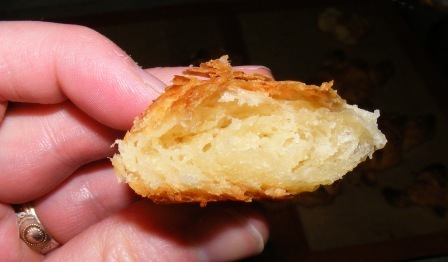 And the shattering crispness of the macaroons was balanced by the slight bite of the pine nuts. So even though these weren’t a rousing success, I’d like to try them again to see if I can achieve results closer to what Sara accomplished when she made them. Based on flavor alone, they are worth a second go-round. I have been looking forward to the next recipe in the Yeast-Risen Specialties section of The Modern Baker for some time. I love croissants and have made them the traditional way a number of times. All the folding, rolling, refrigerating, and turning. And time. Lots of time. I have to say I was somewhat skeptical about a croissant recipe that didn’t include all those steps. But having successfully made Nick’s Instant Puff Pastry, which is also a simplified version of what is usually a complex process, I was encouraged to try the croissants. 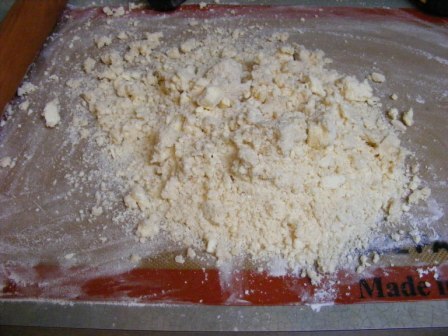 The dough is quite simple to mix in the food processor. I put flour, yeast, salt, and sugar in the bowl of the food pro and pulsed it to mix everything together. 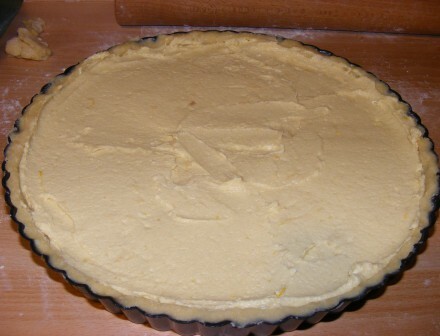 I added four tablespoons of cold butter and pulsed the mixer until the butter was cut in. I then added the rest of the butter (two sticks!) and pulsed the food processor twice. 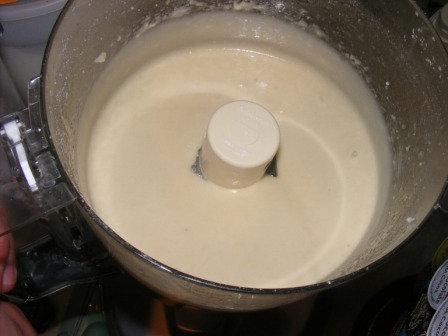 Finally, I added cold milk and pulsed the mixer three times. The dough didn’t come together in the food processor, but the recipe said it wouldn’t, so I knew it was OK. 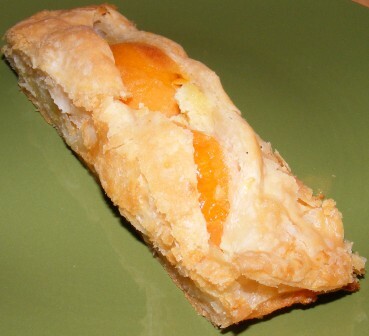 I pressed the dough into a ball, rolled it out into a rectangle, then folded it in thirds. 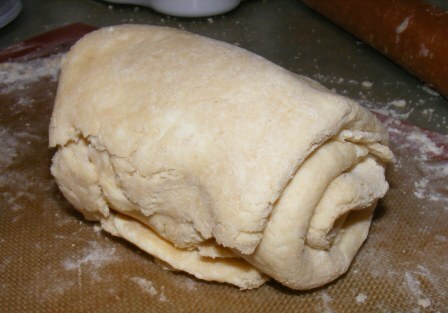 Then, as in the puffed pastry recipe, I rolled the dough into a cylinder. I flattened the dough into a square, put it in a plastic bag, and allowed it to rise for 1 1/2 hours. Then I flattened the dough by smacking it with the flat of my hand, and put the bag in the refrigerator. 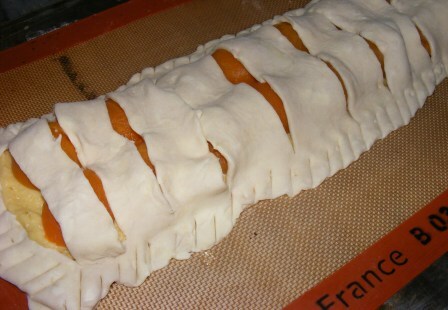 After the dough had chilled for about six hours, I got it out of the refrigerator to roll out the croissants. I had a bit of trouble rolling the dough, but the longer it was out of the fridge, the easier it became to roll. I rolled the dough into a 12 x 15-inch rectangle, which I cut in half lengthwise. 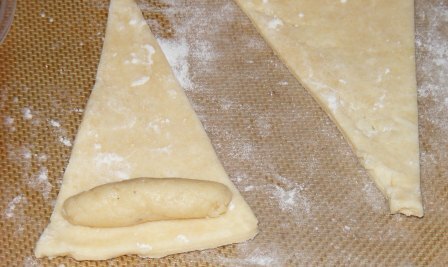 I then cut each strip of dough into six triangles. 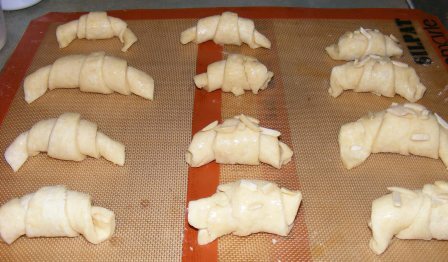 I rolled the triangles from the wide end, pulling the tip slightly as I rolled up the croissants. I made six regular croissants, and decided to make almond croissants with the other half of the dough. I had some leftover almond paste in the fridge, which I shaped into logs and then rolled into the croissants. I put the croissants on a baking sheet and set them aside to rise for about an hour and a haf, until they had almost doubled. 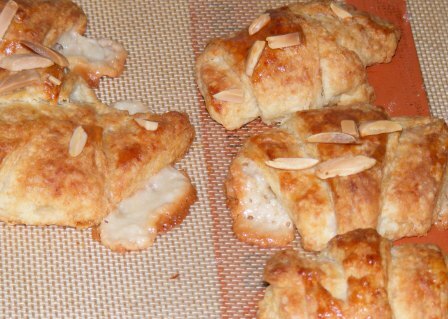 I brushed the croissants with egg wash and sprinkled the almond ones with slivered almonds. I baked them in a 350°F oven for about 25 minutes. I was surprised by how dark the croissants got, but they looked a lot like the ones Andrea made, so I figured that’s how they were supposed to come out. I let the croissants cool, then cut into them. The plain one had a nice crumb, like you would expect to see in a croissant. I have to say, the flavor was a disappointment. The texture was not at all typical of a croissant. The outside was dry and too crisp. 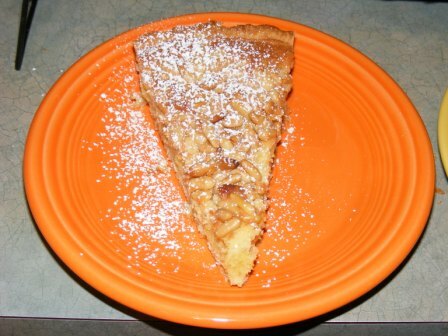 And despite its appearance, the crumb was not light and flaky, but rather dense and greasy. 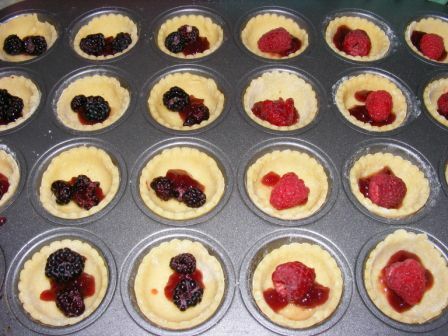 I tried it plain and with jam, but either way, one was enough. The almond ones were better and reminded me just slightly of the almond croissants I used to get at a chain bakery. 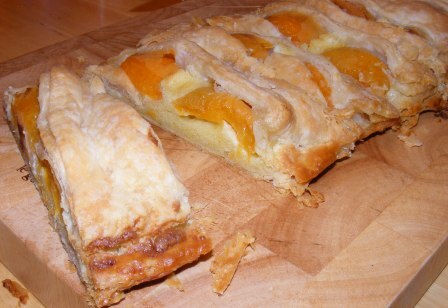 In the end, I only ate two of them, and I’m pretty sure I won’t make them again. 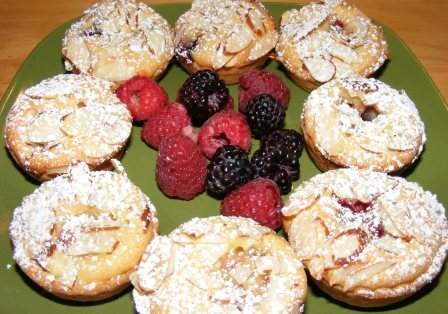 But they did make me think I would like to make almond croissants from one of my other recipes. 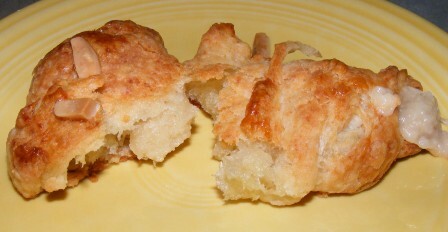 So although these croissants weren’t a big success, they did give me an idea for a future baking project. I had the pleasure of meeting Nick Malgieri a few weeks ago and taking a few classes from him. On the first evening, he featured recipes and techniques from his newest book, Bake! I had just picked up the book a few days before the class, so I hadn’t had a chance to make anything from it. But watching Nick bake, I knew it had been a good purchase. When my friend Kayte mysteriously received a copy of Bake! 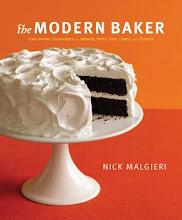 in the mail, return address Nick Malgieri, New York, she was excited to start baking from it. 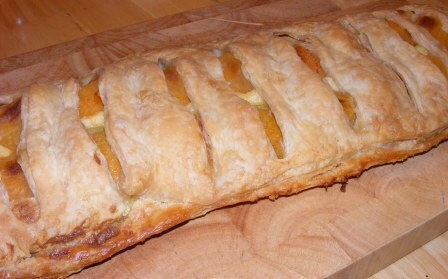 So we decided to do a Twitterbake, where we would both bake the same recipe at the same time and Tweet about it as we went. 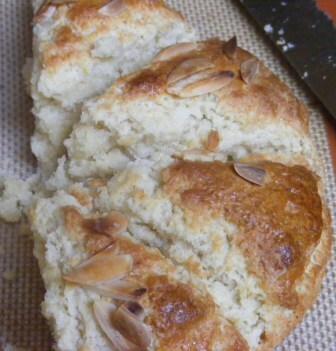 Kayte chose Orange & Almond Scones, which sounded perfect to me. 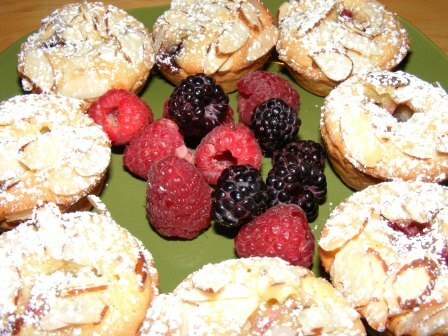 I’m a big scone fan, and these looked great. We had our recipe, picked a time, and were good to go. 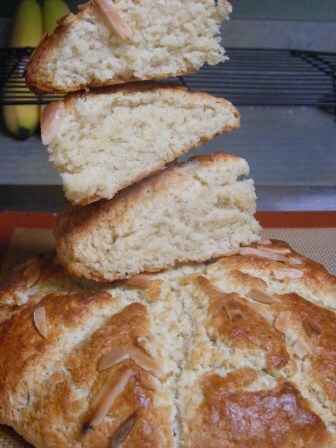 The recipe calls for almond paste. 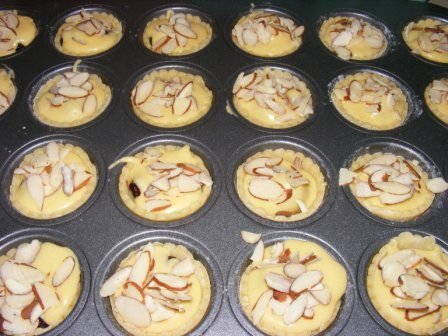 Although I had never baked with almond paste before, there are a few recipes I’m making soon that call for it. And after some searching, I had recently acquired my first-ever can of Solo Almond Paste. 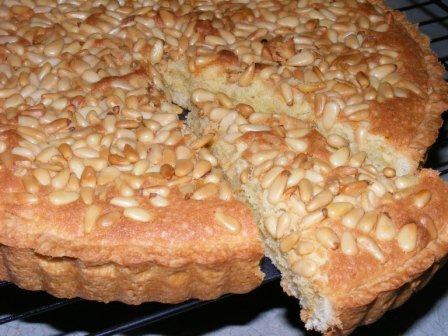 In the process of searching for almond paste and realizing how expensive it is, I had also found a few recipes to make it. 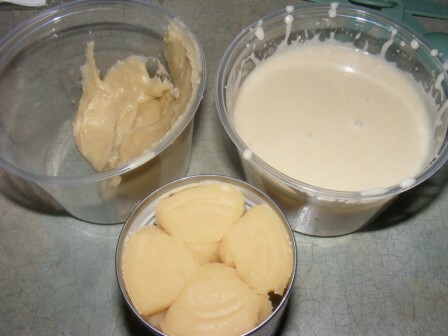 So, the evening before the Twitterbake, I made two versions of almond paste. I liked the egg white version better, so that’s what I decided to use for the scones. 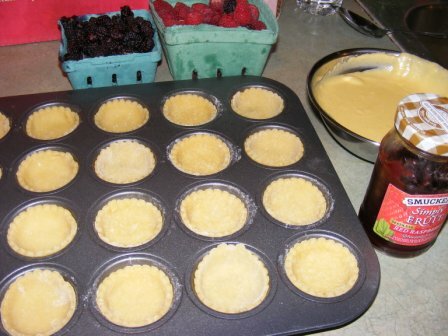 The scones are very simple to make. 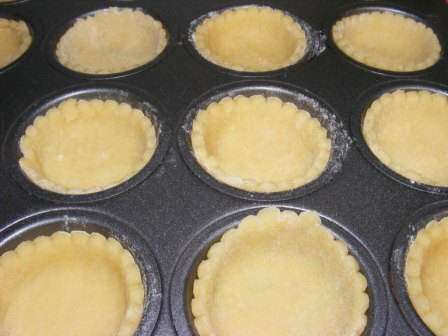 After mixing flour, sugar, baking powder, and salt in the food processor, I whirred in the almond paste, then the butter. 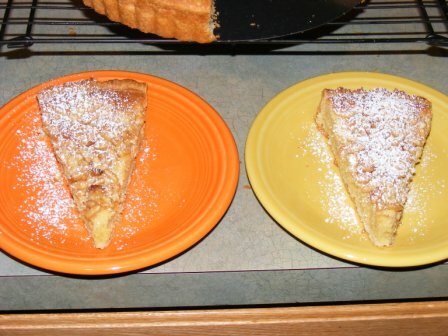 I beat an egg with milk and orange zest, added that to the food pro, and gave it a few pulses. Then I dumped the whole thing out onto a floured board, divided the dough in half, and shaped each piece into a disk. 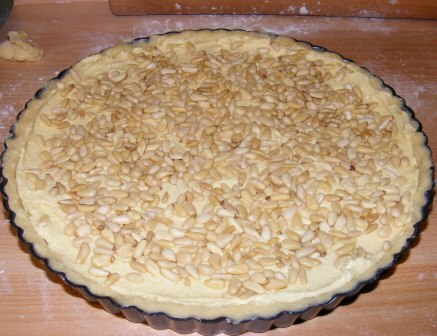 I scored the dough, gave it a little egg wash, pressed on some slivered almonds, and it was ready to bake. As simple as they were, these scones came out great. 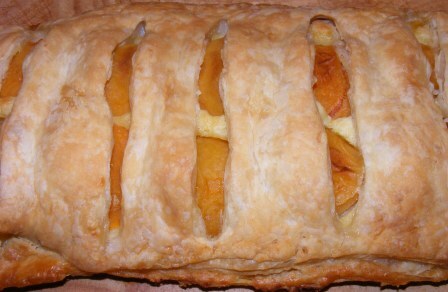 I’m going to serve them when my family comes to town for Thanksgiving and make them again for Christmas morning. From the recipes I’ve sampled from this book so far, I highly recommend it. If you do pick up a copy, let me know. Kayte and I are planning to make a few recipes from it each month, and if you’d like to bake and Tweet along with us, we’d love to have you.